Seyðisfjörður is about nine hours away from Reykjavík by car, and surrounded by high mountains. This creates a small and defined environment in which the festivalgoers spend their time. It has also been said that the mountains contain a crystal with a certain kind of power, which keeps bringing people back. Having spent only three days in this place, I believe this could be true. The town is colourful, lively, calm and beautiful. It also contains the best sushi place in Iceland, Norð Austur. LungA is a weeklong festival with workshops, concerts, lectures, parties and other happenings. The festival ends with a final exhibition of the participants’ work throughout the week and a concert, which this year features Human Woman, GKR, and more. This year’s festival began with an opening ceremony on Sunday night, designed by a youth exchange programme held prior to the festival. Four different schools researched how we could create a socially sustainable society. Over the course of the week, seven workshops will cover everything from dance and painting to karaoke, and more. They serve to provide a creative outlet for the festival’s diverse and talented participants; the workshops are extremely popular and were sold out quickly. It is interesting to witness the festival progress, especially as people get to know each other quickly here. From the first day, beautiful friendships have been in the making. It might be the fresh air, the AMO crépes being served daily or the partying, but it seems that at LungA, everybody are best friends. It might also have to do with the collaborative nature of LungA: when participants work alongside one another, a friendship happens naturally, perhaps more so than at a music festival where one is not forced to interact with others. Despite a fully booked schedule and a busy week, festival goers make sure to spend the nights partying, dancing by the ocean or performing karaoke at Kaffi Lára. The 24-hour sunlight makes it feel as if the day is never over, in a very good way. Aside from participants, there are also resident artists Cold Intimacy, Myrkraverk, Sýnódísk Trópík and STOP CGFC 2016, whose work is featured in an exhibition at the Old Liquor Store as part of the festival. 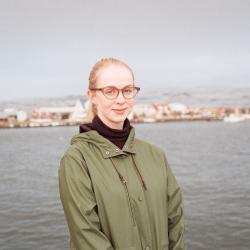 The podcast ‘’Pottcast,’’ hosted by Jóhann Kristófer Stefánsson and Pálmi Freyr Hauksson, covers the festival with interviews and more and volunteers play a big part in keeping the festival up and running. For more information on LungA art festival or LungA school, visit www.lunga.is.